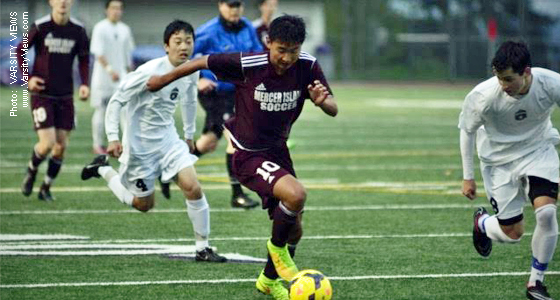 (Jul 13, 2015) Anyone at the April match between KingCo's Mercer Island and Sammamish high schools would have made note of standout midfielder Alex Chung, who managed a hat trick to put the Islanders ahead 4-2 on the evening. Chung, who just wrapped up his senior year and will be playing at Kenyon College this fall, stood out to his coaches, as well, who awarded him the Steve Newman Spirit award, given each of the last three years to a member of the team who embodies former Mercer Island Coach Steve Newman's spirit, love for soccer and community values. According to MIHS Coach Colin Rigby, involved in the selection process, the late Steve Newman was the head coach for MIHS's boys' soccer program for almost 20 years and prided himself on instilling qualities in his players recognized by the award. "Alex loves soccer, is supportive of his teammates, and is a hard worker," says Rigby. "He is a talented soccer player and always wants the best for his team. He is willing to put his body on the line for the sake of his team and teammates. He loves the sport with all of his heart, and we are proud to announce him as this year's winner." According to Rigby, "The award this year is an invitation to spend time with the Philidelphia Union of the MLS. Alex will go to Philly for a week and learn about what it takes to run an MLS club, be an MLS player and learn about the culture of a new city." Rigby calls the award, "…very cool, very unique, and very Steve." "Winning the Steve Newman award is truly an honor," Chung told us. "It means so much for me because the soccer community on Mercer Island is very special." He credits his coaches and teammates for making his senior year at MIHS "an amazing season." Chung got his start playing for Mercer Island Youth Soccer (Now MIFC), then went on to develop at Eastside FC, before taking the next step to play in the US Soccer Development Academy. He was recently also awarded an honorable mention as midfielder in the state's high school 3A division by the Washington State Soccer Coaches Association.